Technique of the Week: Caramelizing | We Like to Cook! Caramelization is the process of browning of sugars. This is a culinary phenomenon that occurs when carbohydrates like sugar are heated to temperatures of 300°F or higher, volatile chemicals are released which produce a characteristic brown color and caramel flavor. Caramelization is related to the Maillard reaction, where proteins in meat turn brown when heated and like the Maillard reaction, caramelization is a type of non-enzymatic browning. Other examples of caramelization include toasted bread and pale white potatoes turned into crispy, golden French fries. Caramelizing sugar for flans, sauces or ice cream topping is relatively easy. The technique varies on what you're using the caramel for, so care should be taken to note in your recipe what kind of caramel is called for. For example, the caramel needed for caramel candies is much less cooked than what's needed for spun sugar. Always caramelize sugar in small batches, starting with no more than 2 cups of sugar. The recipe below is the correct amount for making flan. It is important to keep a close watch on the pan as the caramel cooks. Remember not to use non-heat-proof utensils or to get the molten sugar on your skin because it gets extremely hot. Combine sugar, water, and drop of lemon juice (the lemon juice keeps the mixture from hardening) in the bottom of a medium, heavy-bottomed saucepan; the mixture should resemble wet sand. Heat the sugar mixture over low-medium heat until the sugar granules completely dissolve and bubbles form. We find that by maintaining a lower heat gives control over the caramelizing process, since it is really easy to burn. Sugar melts at about 320°F and will turn to a clear liquid at that temperature. 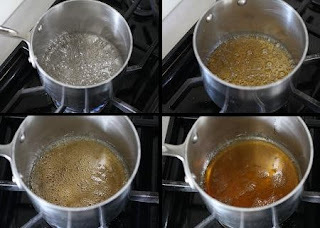 After sugar dissolves and syrup is simmering, cook for approximately 8 to 10 minutes, without stirring. At this point, the tip of a spoon pulled through the mixture should leave a trail. Bear in mind, boiling times will vary according to different stove tops and other factors so keep a close watch. The liquid will turn blonde at first. Swirl the pan gently to distribute color and help sugar cook evenly. As the sugar continues to caramelize, the color will go from golden to a deeper light brown; the darker the caramelization, the deeper the flavor. Watch the changing of the color carefully, it can go past the light brown stage quickly and burn. If it is close close to being done and you are scared of burning it, remove it from the heat and it will continue to cook due to the residual heat. Unless your recipe tells you to do otherwise, remove pan from the heat and set aside and let cool. To stop the caramel from cooking, some recipes have you dip the bottom if the pot in ice water for 10 seconds. For making a caramel sauce, use care when adding cream or other liquid, this should be done very carefully, as the liquid will hiss and sputter. Add the liquid at the edge of the pan, slowly, and stirring constantly as it is added. If you are using the caramel for flan, immediately remove the pan from the heat and pour into individual ramekins or custard dishes, coating the bottoms evenly (tilt the dishes so that the caramel coats the bottom).